Betty Nelson has been drawn to the world of community engagement since first volunteering at a city park. She grew up listening to stories and engaging in conversation with adults. She’s worked with city parks and day campers and has earned the title ‘Recreation Leader’. She’s involved with organizations that focus on diversity and empowerment and is interested in the perspective of others. Now, as she nears completion of her college degree, she’s thinking about where these skills and interests will lead her. Betty, spent the first year of her life in Costa Rica and then her American father and Costa Rican mother moved the family to the U.S. She graduated from Newberg High School, and now 22, is a senior at Portland State University majoring in Cultural Anthropology and minoring in Indigenous Nations Studies. For her Senior Capstone class project, Betty and two other students planned an interpretive hike at Tryon Creek SNA, introducing park visitors to native plants and describing how Indigenous peoples use them. These group projects are just one component of the curriculum offered through both the Cultural and Ecological Education (Fall & Spring terms) and Cultural Ecology in the Urban Forest (Summer term) courses held at the Tryon Creek State Natural Area. 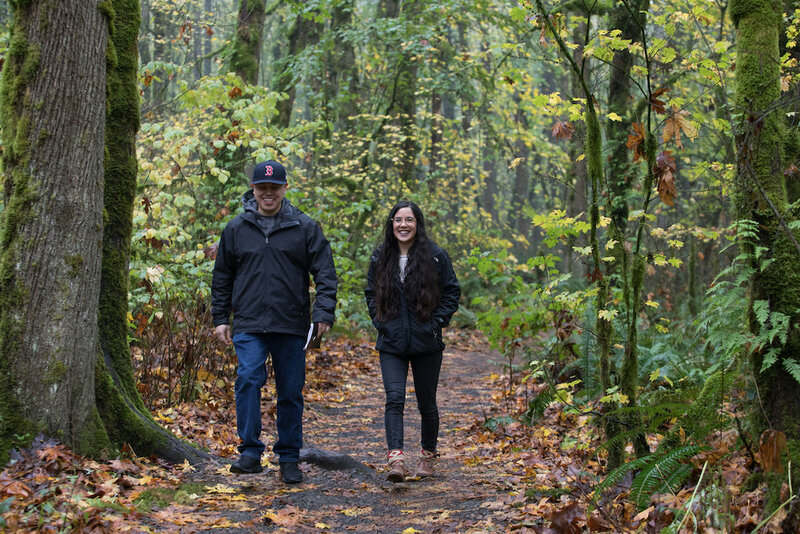 The PSU Capstone courses offered through the Friends of Tryon Creek are collaborations between students, faculty and community leaders designed to give the students a chance to address important community issues. The students develop projects that reflect their interests, studies and skills, that will ultimately benefit the community at large. Designing an interpretive hike and studying the plants and animals of the park led Betty to explore a little piece of family history that has added a new layer to her plans for the future. Betty never met her grandmother. But she’s heard stories about how she used plants from the Costa Rican forest to heal and help members of her village. Gabe Sheoships, Education Director for Friends of Tryon Creek, serves as teacher, mentor and guide for the students. Gabe holds adjunct professor status in both the Indigenous Nations Studies and University Studies Departments at PSU. His goal is for all students is to gather an understanding of the relationship between the land and traditional knowledge. They learn to be critical thinkers and how to communicate with each other and with park visitors who are there participating in a field trip or an interpretive hike. This fall, the students that chose to take the capstone class at Tryon were completing majors from all corners of the PSU campus: bio-chemistry, psychology, film, geology, graphic design and art history to name a few. At their final presentation one morning in the Kraft Room at the Nature Center, the students took turns presenting their work and answering questions. One group led a team of 50 volunteers on an ivy-pulling stewardship day. Another studied groundwater and hydrology and made presentations to middle school students. There was a history booklet designed for children and a t-shirt project, both focusing on the teamwork and the volunteerism involved at Tryon. Adding technology and interpretive layers, another team developed a website that can be accessed by smartphone so park visitors can learn more about plants, animals and stories of the park. The hope is that the materials created and the organization of information accumulated can be used again and again by volunteers and interpretive guides at the park. For Betty Nelson, her project was one more step along the path to where she’s heading. She hopes to use her experience, studies and her command of English, French and Spanish to begin a career that focuses on community engagement. “After graduation, I plan to move back to Costa Rica and work with Indigenous tribes in the southwest along the Caribbean,” Betty says. Some communities are trying to reverse this tension and Betty would like to help. And like her grandmother, the Curandera, Betty seems destined to be an integral part of her community, wherever that may be.